Most organizations realize how important it is to protect their critical knowledge and make it accessible to employees when and where they need it. Despite this, building a sustainable knowledge management program can seem as if it is an uphill battle. Limited resources and an endless swirl of competing priorities can impede the progress of even the best KM teams. But the odds of success improve dramatically if the KM team seeks out strategic partners across the business to collaborate on key objectives, bolster KM’s capabilities, and complement its mission. Most KM programs have at least some level of relationship with these sister functions—especially IT, which KM teams often must work with to co-manage the organization’s content management and collaboration platforms. But when the groups are only loosely connected, they have a hard time building on one another’s strengths and may even find themselves working at cross-purposes. By contrast, close alignment and collaboration among KM, IT, process improvement, and learning groups allow them to project a cohesive strategy for enabling the business and avoid conflicting or overlapping initiatives. An integrated approach also helps to apply the best combination of solutions to each business need, without limiting them to the perspective of any one discipline or improvement methodology. Recent years have seen a lot of convergence between KM and learning functions as more organizations emphasize collaboration, on-demand resources, and micro-learning as part of their professional development offerings. 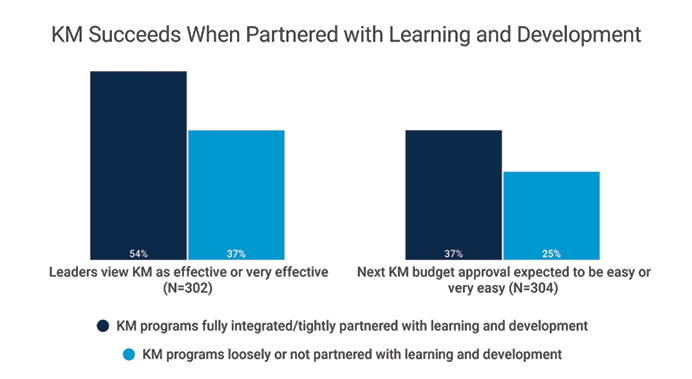 This strengthening relationship is apparent from APQC’s data, in which a majority of KM programs report that they are fully integrated or tightly partnered with learning and development functions. KM and learning teams that work closely together can develop integrated solutions that are easier to understand and use. When employees want to learn something, they do not necessarily distinguish between knowledge repositories and learning management systems. They simply want the best targeted information, whether it is in a community of practice, a how-to document, a webinar, or an online training course. Presenting KM and learning materials together streamlines the user experience and makes it easier for employees to find what they need. Collaboration between the functions also allows KM and learning to boost efficiency by reducing overhead and combining methodologies. Examples include using knowledge mapping techniques to identify gaps in learning content or having experts nearing retirement develop training materials as part of their knowledge transfer plans. One way to encourage KM and learning partnerships is to have the KM team report through learning and development or HR. In comparison to most other reporting structures, KM programs overseen by HR or learning are more likely to enjoy the confidence of leaders and to expect to achieve budget approvals more easily. However, regardless of their reporting structures, KM programs that are integrated or tightly aligned with learning and development seem to enjoy greater stability and sustainability. For example, they are 48% more likely to be perceived as effective or very effective by organizational leaders and 48% more likely to expect their next budget approval to be easy or very easy. Some of this benefit stems from the efficiency gain of merging or dovetailing two similar functions. But a relationship with learning can also play a more fundamental role in communicating KM’s business case. Most executives inherently understand the purpose of organizational learning in supporting ongoing career development and preparing employees to take on new and challenging roles. Since KM has a similar mission (in addition to stewarding the organization’s critical knowledge), explicitly linking the two functions can clarify KM’s impact on important goals like reducing time-to-competency, connecting employees to colleagues who can mentor and help them, and preparing the next generation of internal experts. This, in turn, may boost leaders’ confidence in KM and make them more inclined to approve necessary funding.